Even though March and National Nutrition Month is over, it doesn’t mean we have to stop eating the right foods. You’ve learned about red, green, orange and yellow fruits and vegetables, so let’s talk blue, purple and white produce, too. Blue and purple produce have many different nutrients includ ing, lutein, zeaxanthin, resveratrol, Vitamin C, fiber, flavonoids, ellagic acid, and quercetin. Many of these nutrients are also found in red fruits and vegetables as well. Even though some people think that white is not a color, the white fruits and vegetables have many nutrients, including beta-glucans, EGCG, SDG, and lignins. These nutrients help to balance hormones, which in turn reduces the risk of many cancers relating to hormones. Moreover, they have the ability to activate the B and T cells which help battle cancer in the body, specifically prostate, colon and breast cancer. They also help our immune system which is always a good thing. Eating right with color should be a continuous process that you work on throughout the year. Watch this video to learn some more about fruits and vegetables and incorporating them as a substantial part of your diet. 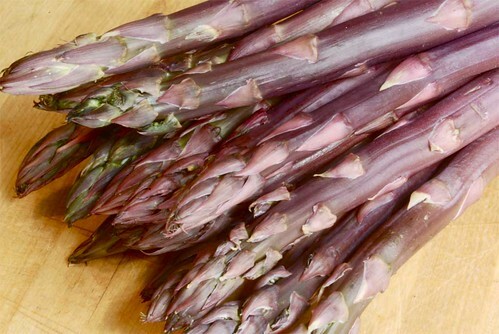 Great food having asparagus tonite !